(Nanowerk Spotlight – Application Note) After two decades of evolution, Atomic Force Microscopy (AFM) has established its strong existence in the material science research field with its nanoscale resolution. Of the systems out in the market, the innovative XE-AFMs from Park Systems have overcome the non-linearity and non-orthogonality problems associated with traditional piezoelectric tube based AFMs. Active in both research and industrial applications including hard-disk, microchip fabrication, and quality control, the XE series has been widely adopted in the nanometrology field. The most recent addition to the XE family, the XE-Bio, has integrated the high resolution of AFM imaging and non-invasiveness capabilities Scanning Ion Conductance Microscopy (SICM) with the versatility of advanced optical microscopy techniques such as scanning confocal microscopy, FRET and TIRF. 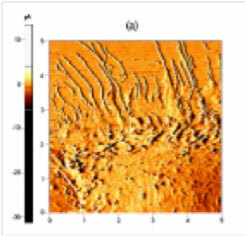 Therefore, the XE-Bio is able to correlate the highest possible spatial resolution with dynamic functionality studies on live biological samples. The 3-in-1 platform of AFM, SICM, and optical microscopy provided by the XE-Bio has made it an extremely powerful tool for contemporary molecular and cell biology research. Full capabilities of the inverted optical microscope allows for bright-field, fluorescence and other optical techniques to be used for the identification of the structures of interest in live biological samples, while the AFM/SICM simultaneously generate nanometer-resolved images of both sample surface membrane and its underlying cytoskeleton structures. Schematic diagram of SCIM operations. Non-Invasive High Resolution Imaging of Biological Samples Using Scanning Ion Conductance Microscopy (SICM). One major feature that differentiates XE-Bio from other AFM systems designed to target the biological sample market is its capability for true non-invasive imaging of cellular membrane structures via its Scanning Ion Conductance Microscopy (SICM) operation mode. In this mode, instead of a sharp silicon or silicon-nitride tip to “touch and feel” the surface of soft biological samples, a glass or quartz pipette with an opening 20-100 nm is raster-scanned above the sample surface. This nanopipette is filled with an electrolyte liquid. An external bias is applied between an electrode placed inside of the pipette, and another electrode located in the physiological buffer solution (typically an electrolyte solution) immersing the biological sample. When the open end of the pipette is scanned across sample surface, ion current passing through this opening is monitored and used as a feedback mechanism to maintain a fixed distance between the tip of the pipette and the sample surface. Such feedback mechanisms insure that the actual pipette tip does not make unintended contact with the sample, therefore avoiding any physical disturbance of live biological samples. This results in true “non-invasive” imaging of samples in their most natural state. Using SICM, even prolonged scan periods extending over several hours does not introduce adverse response from sensitive live cell samples, thereby opening the possibility of following dynamic cellular processes over a long period of time in high resolution. ICM current error images of live mouse muscle cell (C2C12). 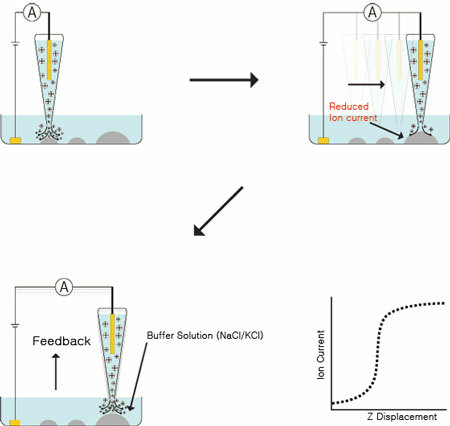 Moreover, the minimal pressure exerted by the ion current on sample surface is largely negligible compared to the pounding force originating from a tapping or deflected AFM tip. Therefore, observation of the most soft and pliable structures on the surface of cell membranes is now possible. Under traditional contact or tapping AFM imaging modes, such structures are easily indented and/or distorted by the nN level normal force exerted by the AFM tip. As a result, in conventional live cell AFM imaging, the hard, underlying cytoskeletons are the only clearly visible structures. Under such imaging methods, live cells are very rarely shown in their real topography, making the task of correlating membrane structure and its function extremely difficult. With the minimal-invasion imaging capability of SICM, molecular and cell biologists are now presented with unprecedented opportunities in functional study of biological processes, using methods such as overlaying fluorescence immune-staining image of trans-membrane receptor proteins and high-resolution image of cell membrane structures. 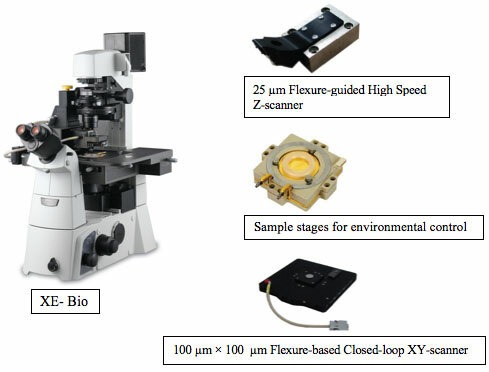 XE-Bio is built on the same innovative platform as all XE systems, incorporating a 100 µm x 100 µm flexure-based closed-loop XY scanner, 25 µm flexure-guided high force Z scanner, and a wide range of optional modes and options including a universal liquid cell for accurate environmental control. Conventional AFM using a piezoelectric tube as x-y-z scanner relies on the bending of the tube to realize in-plane x-y motion, which not only causes z position error, but further introduces background curvatures. Such introduced background curvature is virtually impossible to differentiate from real sample curvature, especially on surfaces as complicated as live cell and tissues. The award-winning XE-platform, on the other hand, has completely separate XY and Z scanners. Decoupled flexure scanners eliminate background curvature in even the scans of the flattest samples. The XE-Bio has incorporated this innovative solution from the nanometrology field into the world of biological sample imaging, allowing the true sample topography to be resolved without the artifacts of scanner coupling and bowing. Traditional tube scanners are very slow actuators with highly limited Z-scan bandwidth of only 500 Hz or so, therefore, the Z-servo response is too slow to maintain non-contact mode, a critical capability for prolonging tip lifetime and minimal-disruptive imaging of soft biological samples. On the contrary, the high-bandwidth, low-inertia flexure-guided Z-scanner of the XE-Platform allows AFM imaging in the attractive van der Waals force regime using extremely small tip vibration amplitude, therefore minimizing tip-sample interaction and drastically decreasing permanent damage of soft biological samples. By successfully maintaining a small tip-sample distance and avoiding un-intentional contact between the tip and the sample, contamination of the tip by adhesive macro-molecules on cell surfaces can be largely avoided. The sharpness of the tip can be preserved much longer, which in turn results in the preservation of the highest possible image resolution. In addition to its superior precision and accuracy, XE-Bio has also inherited the intuitive, straight-forward, user-friendly interface of the XE-AFM family. With EZ laser beam alignment, fast and easy automated tip approach, and pre-set scan parameters for non-expert users, XE-Bio has provided cellular and molecular biologists a “one-click” solution for biological AFM sample imaging. The modular design of XE-Bio allows easy slide-on exchange of the SICM and AFM imaging units, and the large opening around both the AFM and the SICM heads ensures easy accessibility for electro-physiological experiment set up as well as targeted local stimulation of live cells. XE-Bio system is adapted to all major models of inverted optical microscopes including Nikon, Olympus, and Zeiss. Using stage adaptors, XE-Bio system can be mounted onto the inverted optical microscope, allowing information collected by traditional optical microscopy methods, such as confocal microscopy or fluorescence immono-staining, to be collected and analyzed simultaneously with high-resolution structural data. The design of the scanning head allows top-down condenser lens access of sample surface, therefore ensuring DIC and phase imaging capacity of the internal structures of cells and tissue samples and allowing detailed comparison of optical and mechanical contrast-generating mechanisms of different cellular components. Such optical imaging capability also opens the door of studying cell response to mechanical stimulations (from AFM tip), electrophysiological stimulations (from ion current) and biochemical stimulations (from functionalized AFM tip of nanopipette). The XE-Bio system has opened a wide array of gates leading to tremendous flexibility and potential breakthroughs in functional molecular and cell biology, as well as nano-medicinal research.